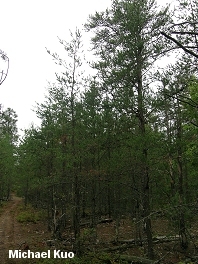 Short, scraggly northern pine with short needles in bundles of 2; bark not orange; cones short, often incurved on the branch and remaining closed for years. Habitat: Usually in pure stands in dry, barren areas, sandy or rocky soils, and so on; often a colonizer of burned or logged areas; northern North America. 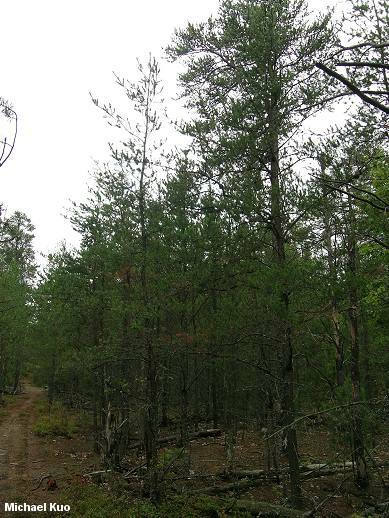 Stature: 25-70 feet high; to 2 feet in diameter; with an open, irregular, scraggly crown. 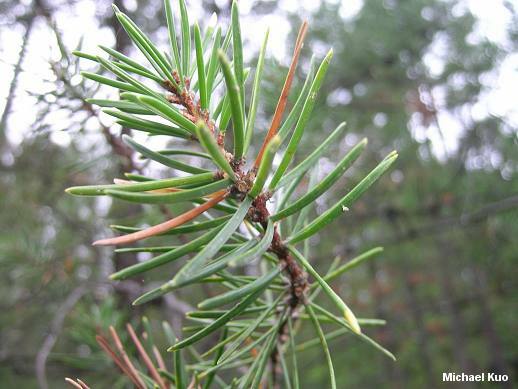 Needles: In bundles of 2, often forming a wide V; up to 1.5 inches long; yellow-green; often twisted. 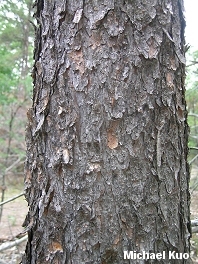 Bark: Thin; dark reddish brown; shallowly furrowed. Cones: 1.5-2 inches long; not symmetrical; scales not developing or separating evenly; often remaining closed on the branch for years. Boletus projectellus, Suillus salmonicolor, Suillus tomentosus, Tricholoma magnivelare, and many others.